When visiting a zoo or an animal attraction, you may find animals with no fresh water, very little space to move, hard substrates or nowhere to retreat to from constant public view. These are clear signs of poor animal welfare. Like us, all animals need water and food, an appropriate environment, the ability to express normal behaviors and the ability to avoid conditions of fear and distress. To help assessing animal welfare conditions, a framework called the 5 Freedoms has been designed in the 60s that is now widely accepted. It focuses on 5 basic conditions. The “Five Freedoms” ([5F], [RTA], [KR15], [MC13], [WN16]) is used in the field of animal welfare science, advocacy and as policy tools. It is widely recognized by authorities in animal welfare in government, academics and animal protection organizations, and more and more in ethical travel organizations. Whether you are wildlife enthusiast, a volunteer, you can use this simple knowledge to assess if an animal attraction has considered the well-being of its animals. Consider that when any of the following basic needs is compromised or prevented in captive wild animals, it can seriously impair the welfare of an animal and can also have an adverse effect on public safety. 1. Freedom from Hunger and Thirst —by ready access to fresh water and a diet to maintain full health and vigour. 2. Freedom from Discomfort —by providing an appropriate environment including shelter and a comfortable resting area. 3. Freedom from Pain, Injury or Disease —by prevention or rapid diagnosis and treatment. 4. Freedom to Express Normal Behavior —by providing sufficient space, proper facilities and company of the animal’s own kind. 5. Freedom from Fear and Distress —by ensuring conditions and treatment which avoid mental suffering. The Right Tourism organization provides good key details regarding the 5 Freedoms as well as useful indicators to pay attention to when evaluating welfare conditions of animals in captivity. We pulled this list here for your convenience as well as augmented it with few new recent indicators that revealed being critical to proper welfare and mostly relating to prevention of and reducing human noise disturbance. Captive animals must have access to clean drinking water at all times and provided with a diet that is appropriate to their species and will keep them healthy. This also means that visitors are actively prevented from feeding the animals. Different species also require carefully managed schedules for their feeding and nutritional requirements. Some captive wildlife might also need mineral and vitamins supplements as part of their diet. Animals must be provided with a suitable environment consistent with their needs. A suitable environment includes shelter from rain or cold and provides shade from the sun as appropriate. The climatic conditions and space must also be suitable to which the animals are naturally adapted to. For example, arctic animals such as polar bears should never be kept in tropical climates. A suitable environment include seclusion areas or hidings so that the animal can hide comfortably from view and the public. Not providing hidings has proven to cause high stress in the animal and increase aggressive behavior. The substrate is crucial for an animal’s overall welfare. Substrates such as sand, grass and soft bedding can be ideal (depending on the species). Concrete or wire mesh floors are chief causes of discomfort, pain, infection, and injury to captive animals. Hard surfaces such as concrete can also be uncomfortable or physically challenging to animals. Chaining animals also cause severe discomfort and injury. A proper environment includes protection from human noise disturbance. The human voice has raised in intensity in the past decades (as the result of louder human environments) and is detrimental to the health and behavior of animals. This has a distressing impact on the animals in captivity and has proven to be correlated with aggressive behavior, heightened vigilance states, and generally increased discomfort and stress. All captive wildlife should be given qualified veterinary care and whenever needed. This also means that the zoo have veterinarians on staff and readily accessible. Sick or injured animals should not be on display or have contact with the public, Veterinary care should also be administered away from public view. Animal enclosures should be designed and constructed as such that the interiors minimize the risk of injury, the spread of disease or pose any other dangers. There should be space and furnishings to allow individual animals to escape conflict or aggression from other animals sharing the same enclosure. Visitors should not be able to feed animals. Animal enclosures should also be hygienic, cleaned regularly and cleared of excrement daily (while avoiding erasing scent marks), to prevent risks of disease including zoonoses –i.e., the transmission of disease from animal to humans. Wild animals need space and opportunity to express their most normal and natural behaviors. In captivity, careful and considered efforts must be made to construct physically and psychologically inspiring environments to provide an animal with its needs. Ignoring some the basic behavioral needs lead to animals displaying abnormal behaviors, a.k.a. Stereotypic behaviors or zoochosis such as rocking, self-mutilation, and swaying. See our Animal Behavioral Indicators. In the wild, some animals can spend several hours a day traveling over vast distances to forage, find water or as part of their mating and usual behavior. For animals such as polar bears and elephants who roam over vast distances in the wild, and cetaceans and sharks that travel the vast seas, it is very difficult to simulate the space they need in captivity to keep them happy and healthy. Note that the rationale that since they are provided with food, then they don’t need much space is totally flawed from a natural history, sensory ecology and more generally from an ethical angle [MK07]. 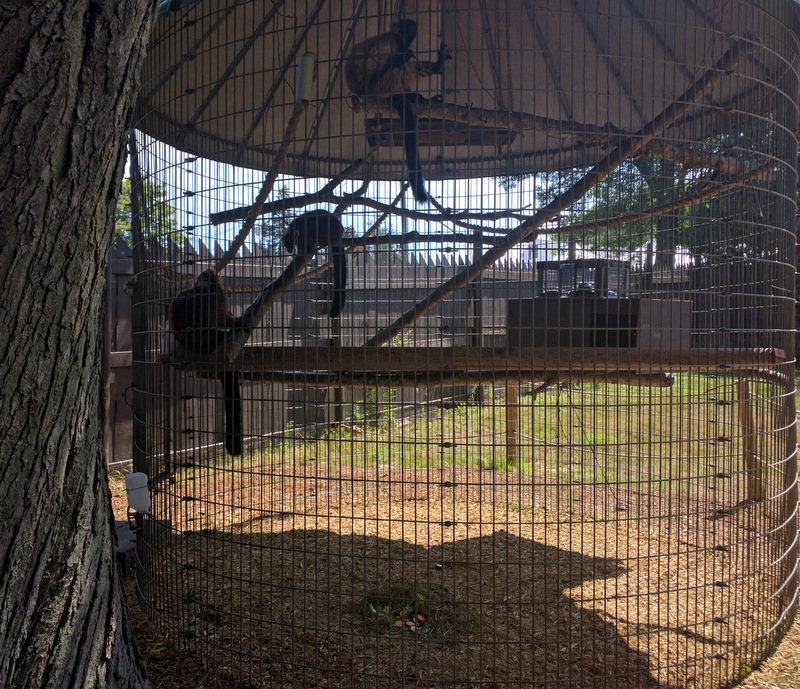 Appropriate furnishings in enclosures can help encourage some animals’ natural behaviors. For example, animals that dig or burrow must be provided with a soft substrate, animals that swim need to be able to swim, and primates such as gibbons need trees with long branches to swing. 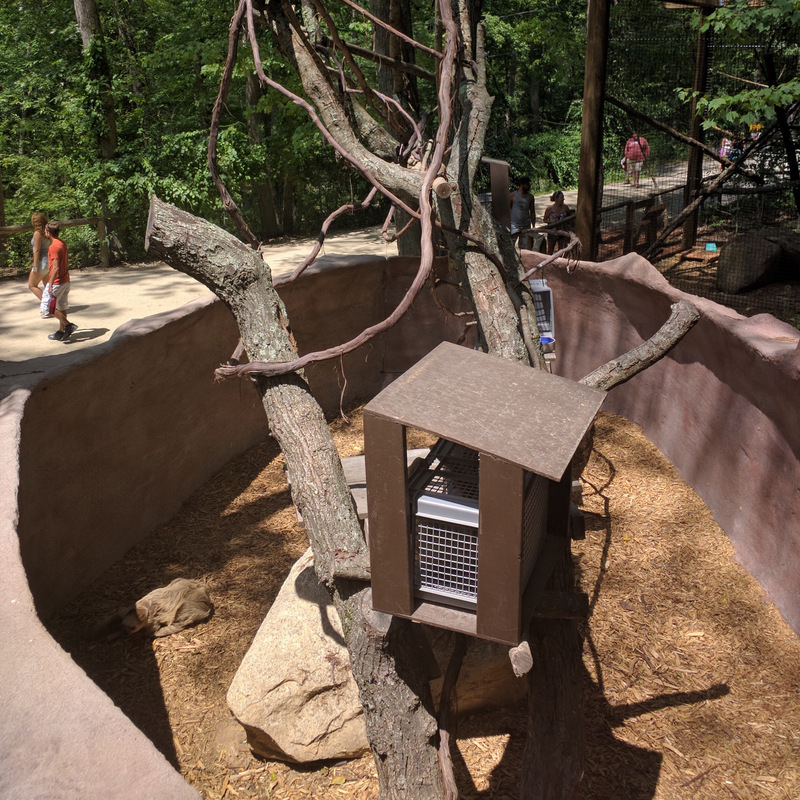 In captive environments, such as in zoos or rescue centers, it is essential that environmental enrichment programs are also in place for all the animals, This helps them to express some natural behaviors and keep them occupied. Animals should never be chained or kept in small enclosures as this denies them of even their basic need to move freely. Nocturnal animals should also not be subject to dark enclosures fit with artificial lighting so the public can see them. Visitors should also refrain using flash photography. A captive animals’ environment should ensure conditions and treatment that avoid mental suffering. 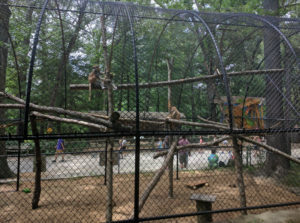 The enclosure design should encourage normal behavior and provide areas of retreat from other animals and from public view. Overcrowded enclosures can be very stressful for individual animals. When animals cannot retreat from each other, this can lead to unnatural aggression among them and can result in serious injuries. Note that social isolation for gregarious species also leads to distress. In the wild, animals seek places to hide to avoid predators, rest safely and to care for their young. 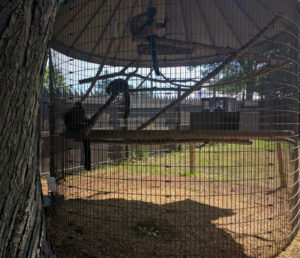 Predator species such as big cats or wild dogs housed next to primates or hoofed stock, noise from loud speakers used for amusement rides or shows, can all cause severe distress for animals in captive environments. 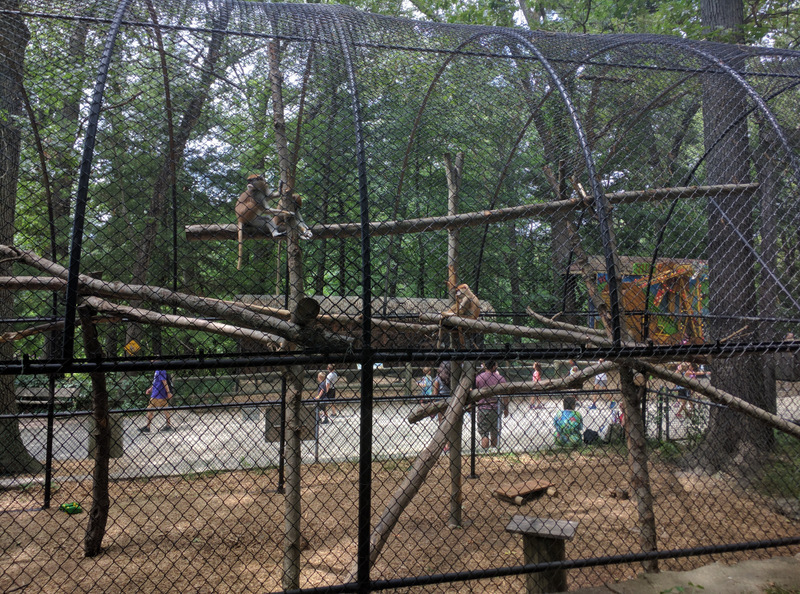 Animals also need areas in their enclosures where they can hide to escape from the constant view of the public. Visitors should not be able to tease and harass animals and human contact should also be kept to a minimum. Animals should not be subjected to activities such as performing unnatural acts for shows or photo-taking with visitors. Staff should also be knowledgeable of the species’ behavioral needs and respectful towards animals in their care. An often overlooked issue is one of human noise disturbance ([MK07],[QS14]): the sound of our voice and of our equipments. A suitable environment should also account for protection from human noise disturbance –and this includes our voice. The human voice has raised in intensity in the past decades (as the result of louder human environments) and is detrimental to the health and behavior of animals. This has a distressing impact on the animals in captivity and has proven to be correlated with aggressive behavior, heightened vigilance states, and generally increased stress. Visitors, in general, should remain quiet in all circumstances, refrain from laughing out loud, and from expressing loud emotions. This should be enforced directly by the staff (warning signs do not work). Enjoy in silence. The references mentioned in this page are listed in the Extended Bibliography.